The HTC HD2 – a smartphone released no less than three years ago, has been subjected to more than a few hacks since the day of its arrival. Although the device was launched running the now-obsolete Windows Mobile 6.5, developers have managed to flash several Windows Phone 7 flavors on it. Even an Android ROM based on Jelly Bean was developed earlier this year. But perhaps this most recent hack tops all of the above. The developers at Dark Force Team got Windows Phone 8 running on the HTC HD2, albeit to a limited extent, and the photos you see below were posted on Twitter as proof. As you might expect, there are many things that don't work, but the hack demonstrates that even relatively old hardware may be capable of handling Windows Phone 8. 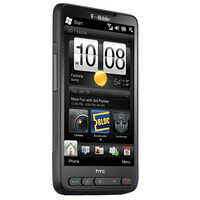 In case you need a refresher, the HTC HD2 has a 1GHz single-core Snapdragon S1 chip with Adreno 200 graphics and 448MB of RAM. The DFT team notes that their hack is just a "proof-of-concept", though, so don't expect a fully-working Windows Phone 8 ROM to be released for the HTC HD2 anytime soon. *2045* Android 16.1 has been hacked onto the HTC HD2 again. xD This phone simply never dies. It never dies as it has 2012-like specs.. Single core 1ghz processor was monster at that time. Still That single core is a tough one, it'll knoc-out every single core of those quad-core processors, one by one... The original SnapDragon S1 is a great chipset. don't say that around Remixfa. I bet u are tooooo used to powerful handsets like the S3 and any other phones with S4 processor. Good ol HD2... the best Windows OS phone ever :) it can even use windows 8 and windows 7.5...... And its a Wm6.5 phone :) Gud 1ghz phone by HTC. This was such an awesome device. Lol its funny tho, 4.3 then was unheard of and now my Note 2 makes it look like a tiny baby. And so the HD2 lives on, simply incredible how its dev community has kept it going for so long. My neighbour had one. But her baby smashed it. It's camera and video recording was great. But the OS was ridiculous. hd2 is sample of the best w.p..its always solid.. I almost bought one of these when they were first introduced, if I had known how much modding this would have received I might have made the purchase. If memory serves, wasn't the is the first of the big screen phones? Depends on what you mean by "big screen", but it was the first with a 4.3" display. I think he means that at that time 4.3 was considered huge. Exactly, at the time it was huge. Now it's just kinda average, but it was impressive for the time. Loved the c00kie ROM and other 6.5.3 ROMS, they looked better than most Android ROMs today. This phone was my first chance to test out Android and Windows Phone before actually getting an Android or Windows Phone device. And I fell in love with Windows Phone over Android but I still appreciate both OS's. this phone is really awesome!! it can run android and WP! that is nice!!! and i love the look of these phone! and the sense UI on winmo just look perfect!! i wonder why microsoft ditch winmo, since this is actually customizable! coz of the darn customize UI! .....And back when Gingerbread was just released.... You might say.. And yet so many Android phones still sit around with FROYO.. And when Lime key pie 5.0 is out You will say... And yet so many Android phones still sit around with ICS and JB.. Things changes fast. And Gingerbread is no doubt the most popular and compatible android version of all time. Best Android version?? Love this phone gotta fix the digitizer on it though because the screen stopped working.